For the outside world who has no idea what a Paw Paw is, you have missed a true autumn treasure. Creamy, mellow, and richly texured like a custard, Paw Paws are an Appalachian treat foraged on the edges of our woodlands. Follow this link to learn What is a Paw Paw or Pawpaw? High above the creek bank, eye level with the tree canopy, is Miss Viola’s Paw Paw Porch. On a cool autumn day, when the leaves are green but teasing with yellow, Miss Viola greets us. Her smile is warmer than dappled Kentucky sunshine. I laugh and inform her she is just jealous of the shoes. A resounding snort of denial echoes through the kitchen, as we fill glasses with the south’s most beloved elixier, sweet tea. The tall glasses drip cool beads of condensation, as we go clinking to what some might call a covered veranda. To us, it is just the Paw Paw Porch. We have a choice of seating. Vintage yellow lawn chairs, or crisp white rockers in a neat little row. We choose the rockers. Together we survey the back forty. Sun shimmers on the creeks wandering waters. To the right, is the field for sweet potatoes. Crops have been hard to come by this last couple of years. What the floods didn’t ruin, the deer gnawed off. Deer are a nuisance. No sweet potato crop means store bought ‘taters for Thanksgiving. Miss Viola wrinkles her nose at the prospect. I suggest deer hunting off the porch, never having to leave our rockers or our glasses of tea. There is a brief silence, while we survey the barren fields. Viola nods knowingly. “It has been suggested before. How’s your aim?” We giggle. Looking to the yard below, she tells me there are paw paws lying all over the place. I don’t see a single one, but being respectful I walk down the long run of steps to take a look. Sure enough, there are paw paws aplenty. I trade her jar of Blackberry Jam for the paw paws. We are both pleased. Autumn is best shared with the friends who know you best. Perhaps over tea and paw paw cake. ½ cup pureed pawpaw pulp be sure to remove seeds! 1. Preheat oven to 350° Lightly grease and flour 2 9 inch cake pans. 2. In medium bowl whisk together flour, soda, baking powder and salt. Set aside. 3. In a large bowl, cream butter and sugar well, then add 2 whole eggs, buttermilk and vanilla beating until soft and fluffy. 4. Alternate adding pawpaw puree and flour mixture to the butter mixture, stirring to moisten. 5. Add nuts barely stirring in. Let batter sit for about three minutes, allowing the leavening agents time to work. 6. Ever so gently fold in egg whites, this gives the cake a light lift…so just barely work them in. 7. Pour batter into 2 9 inch greased and floured cake pans; bake for about 35 to 40 minutes until a toothpick inserted in middle comes out clean. 8. Run a knife around edge of pans, flip cake onto racks for cooling. Frost. 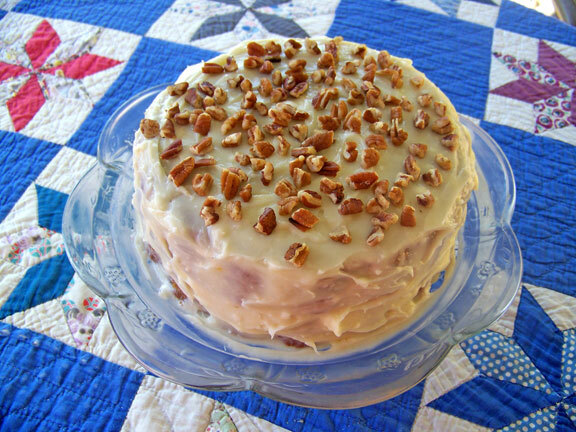 A traditional cream cheese frosting works well with this recipe, adding a few nuts to the top for interest. I made a bourbon flavored frosting for this project. 1. You could mix the butter and cream cheese by hand. I usually do, but if Charlie is in the kitchen he uses our handy dandy KitchenAid mixer. With the electric mixer blend softly for about 3 or 4 minutes. 2. Gradually add sugar, bourbon, and nutmeg until you get a thick icing consistancy. 3. Once cakes are cooled, spread icing with a spatula. For extra wow, I throw about a 1/3 cup of nuts on the top. If you really want a bourbon pop, soak nuts in small amount of the Kentucky bourbon overnight. Serves 8-12 depending on how hungry your guests are. Just letting you know that the pawpaw cake recipe doesn’t say when to use the buttermilk. I mixed it with the pawpaw puree. Overall I found the cake to be very good and will use the recipe again, thanks! Made the correction. Thanks for pointing that out!